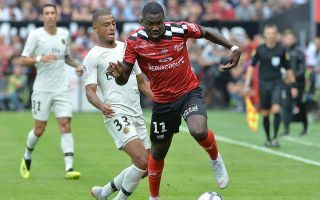 Arsenal and Borussia Dortmund are reportedly among the admirers of exciting young Guingamp forward Marcus Thuram ahead of what looks like a likely summer transfer window move. The 21-year-old attacker is having a fine season in Ligue 1, and French source Le 10 Sport suggest the Gunners have laid the groundwork to make an offer for the player ahead of the summer. Thuram can play out wide or up front and could certainly do an important job for Arsenal, who have had to rely on some inconsistent attacking midfield performers this season in Henrikh Mkhitaryan and Alex Iwobi. It’s easy to see how Thuram, son of the legendary World Cup winner Lilian, could be an upgrade on those two, and Le 10 Sport make the point that Arsenal manager Unai Emery also knows the French market pretty well. Gooners will hope this can give their club some edge over Dortmund in this potential transfer battle, though the Bundesliga giants have shown themselves to be a great stepping stone for young players hoping to launch a big career in Europe.